Though few Canadians have ever heard of the Centre for Creative Communications (formerly the Bell CCC), many are intimately familiar with this famous East York landmark. Constructed as the Toronto Teacher's College in 1955, the 104,000-square-foot modernist masterpiece achieved fame as the setting for the CBC series Degrassi High, which was filmed on location at the otherwise abandoned school between 1989 and 1991. After Joey, Snake and the gang graduated from Degrassi, the old school at the corner of Mortimer and Carlaw lay empty and unused. Centennial College was determined to rebuild it, and they had the technology. Centennial and its private-sector partners poured more than $35 million into making the school better, stronger and faster than it was before. The millions of dollars worth of computers and radio and television equipment were protected by a new security system of closed-circuit cameras surveying every hallway and electro-magnetic card locks on virtually every door, in addition to patrolling security guards. As perhaps the only school in the world where the high-tech computer workstations outnumbered the students, the Bell Centre had transformed into more of a modern technological showcase for its corporate sponsors than a decades-old institution. Or so it seemed. The Bell Centre was the first school I attended to which I felt any attachment. It was actually during the year I spent there that I caught the infiltrating bug in a big way, and hacking the school kept me busy between my graduation from St. Michael's Hospital and my discovery of the wonders of the Royal York Hotel. My two fellow adventurers, Harpocrates and Locke, had already propped open the appropriate door when I joined them at the Bell Centre for a night of nostalgia and exploration recently. We turned on our flashlights and readied our cameras as we headed under the school's auditorium. Opening a tiny square door set into the wall halfway down the stairs, we peered down an extremely dusty and dimly lit utility tunnel. I confided that back when I'd been an antisocial student at the Bell Centre, I had occasionally snuck down to this tunnel to eat my lunch alone. The dirty, cramped spot had always offered me a safe haven from the too-perfect school and provided a nice reality break when I'd been using computers too long. 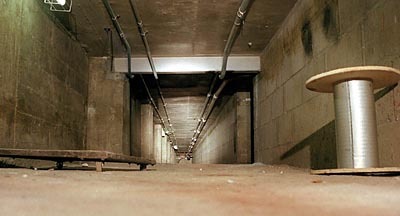 My comrades offered me pitying looks as we bypassed the tunnel and continued down the stairs into the basement. Exploring the tiny, long-abandoned red brick classrooms under the school by the light of a flashlight was a distinctly creepy experience. In one classroom, the wall and floor were liberally splattered with a dark red liquid  fake blood, we imagined (hoped). After investigating several of the old classrooms, we checked out the ancient washrooms and the old metal shop, and then headed down the cement corridor towards the whirring and clanking of the engine room, with me getting more excited with each whir and clank. The tunnels start very small. Fortunately, they get bigger. In the engine room, Harpocrates found some old ad boards about the school and was explaining to me how Centennial had pitched the idea of the Bell Centre to various corporate sponsors, when suddenly we heard noises above us that sounded like the door to the auditorium being opened. 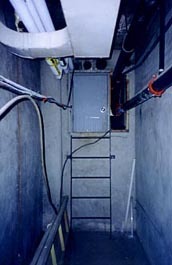 After exchanging a few nervous glances, we quietly climbed up the ladder at the far end of the engine room, passed through the tiny door at the top of the room, and crawled up into the utility tunnels beyond. The tunnels under the Bell Centre are old, dusty, cramped and wonderful. It felt great to be back exploring the depths of my alma mater, and I was excited about the new find Harpocrates had refused to describe to me beyond promising that I would love it. The three of us had to hunch over quite a bit to walk down the tunnels, and there was no possibility of one of us squeezing past another. We navigated the tunnels as quietly as possible, as we could still clearly hear the noise of people talking directly overhead. We emerged from the tunnels near the roof of a large boiler room. There was no ladder down, so we grabbed hold of some pipes and used them to lower ourselves down. At the opposite end of the boiler room was a messy little metalworking shop that looked like it hadn't been used in years. 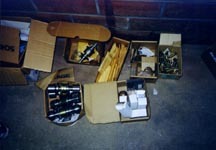 It was really just one small table and a disorganized assortment of tools, engraving implements, and  o wonder of wonders!  keys! Boxes and boxes of keys! 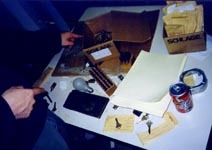 While many of the keys were blank or unlabelled, many others were tucked into small envelopes labelled with room numbers. We giddily rifled through a small pile of paperwork, finding a few sheets offering further information on which keys opened which doors and several key request forms dating back to the early 1990s. We borrowed several powerful-sounding maintenance keys (all of which we later returned) and then took our leave. a room full of keys and indexes to all the doors they opened! For reasons unknown, tunnels under the school led to fairly fancy shower stalls. We emerged into a section of the basement that was entirely new to me; a narrow hallway lit by the red glow of an EXIT sign. All the rooms here were locked, but that was no longer a problem. Locke wandered around the hallway with a large keyring dangling from his mouth, trying his various keys in all the doors. We couldn't get into the room labelled "PCB storage area," but had no problem gaining entry to several small rooms filled with old files, outdated computer equipment, and even an old changeroom with a shower. A strange touch in a school that's never had an athletic program. 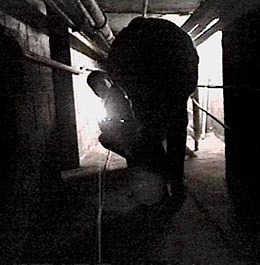 When we'd had enough of this, we returned to the boiler room, clambered back up the pipes and returned to the tunnels. Taking a different turn this time, Harpocrates led us into a narrow and completely unlit series of tunnels that reeked of oil. After a few turns, our tunnel emptied at the top of a large, unlit room. We shined the flashlight down into the oil-scented room and saw that it was primarily occupied by a very large pit of full of sand. Harpocrates imagined this was an old oil-powered generator that the school elected to bury in sand rather than attempting to remove it slowly through the tunnels. Again, there was no ladder from the tunnels into the room below, so we lowered ourselves down by hanging onto the sides of the sandbox. Exiting the sandbox room, we moved on to an electrical room, where we surveyed far more high-tech heating equipment, including touch-screen operated temperature controls for the building. After we left the electrical room, my hosts assured me we'd seen the best of the basement, so we headed up some stairs and back out to the public areas of the school. A cage at the top of the stairs barred our access to the door leading to the roof. We climbed over it to check out the weird machines on top of the school. For dessert, the three of us decided to conquer the roof. Taking the stairs all the way to the top involved a minor bit of climbing around a metal cage erected near the top of the staircase. None of us fell to our death, and soon enough we were prowling around the gravel-covered roof of the school at night. There were a few nice engineering toys up here, and a decent view of the school grounds and the nearby construction site, but before long we decided to call it a night. Harpocrates climbed back down around the cage first, telling Locke and I that he'd give us the okay as soon as he was sure the coast was clear. Once he'd made his way down the stairs, however, the first words we heard out of his mouth were "Oh hello... Just looking around." A few seconds later, a female security guard was looking up at Locke and I with a shocked but slightly amused expression on her face. "You scared the life out of me!" she told us, and then instructed us to climb down. Luckily for us, she was in a good mood and simply told us to stay out of trouble for the rest of the night. We gratefully and humbly obliged. This article originally appeared in Infiltration 14, together with some articles on exploring scary places.